Steph stops in for a visit while Janet works on our discharge checklist. For many years, I was terrified of childbirth. I don’t know why I was so scared. Women have been performing this miracle for centuries. But, nonetheless, I was nervous. I worried about the pain, the aftermath and the embarrassment of all of the yucky parts. 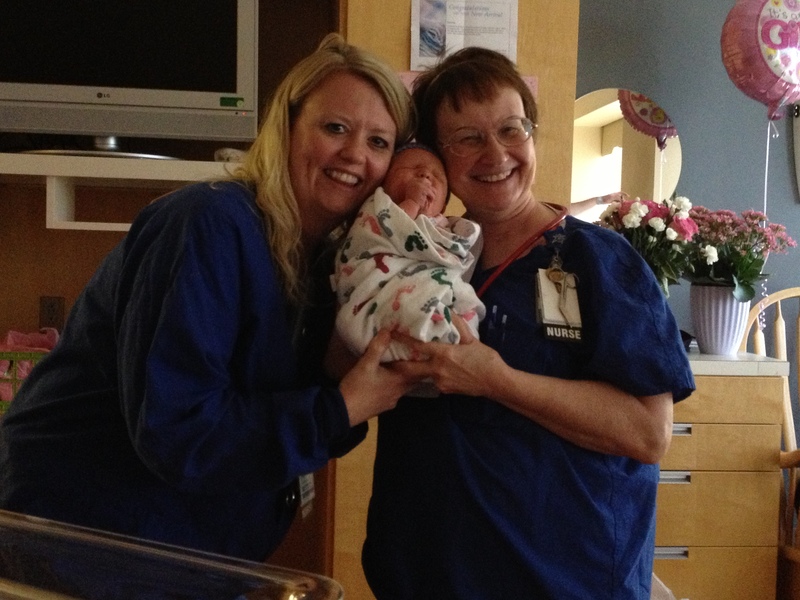 But, I must say that delivering little Charlotte at Iowa Methodist Medical Center was simply a wonderful experience. I must, for the most part, credit the nurses. I had seen some Facebook status updates recently honoring nurses on National Nurses Day. And, I thought – well, why is there no National Marketing Managers Day? My job is important, too. Ha. I must say that now I get it! These nurses give it their all, deal with some pretty nasty stuff and do it with a smile. I just want to dedicate this post to the nurses who worked during induction, contractions, pushes, delivery, baby well-being, overnight in the the nursery, postpartum recovery and most importantly… to those ladies who answered all of my silly “new mom” questions. The nurses I remember the most – perhaps because at times I was too tired to remember the names of the nurses in between – were Steph and Janet. Steph took over after my failed Cervadil induction and saw me through my Pitocin pain, my epidural, my pushing and the moment our little love first saw the light of day. She was so relaxed, so comforting and so encouraging. She made me feel like an Olympian, and in turn I pushed that baby out like an Olympian! Janet was my postpartum nurse. She spent our last day in the hospital pretty much holding our hands through each little detail of my recovery, Charlotte’s homecoming, baby care and more. She made us laugh, listened to us like we were old friends and gave us the confidence we needed to head home with our daughter. I will forever remember all of the hard-working women of the Labor and Delivery floor at Iowa Methodist. Charlotte may not, but Mom and Dad certainly will! 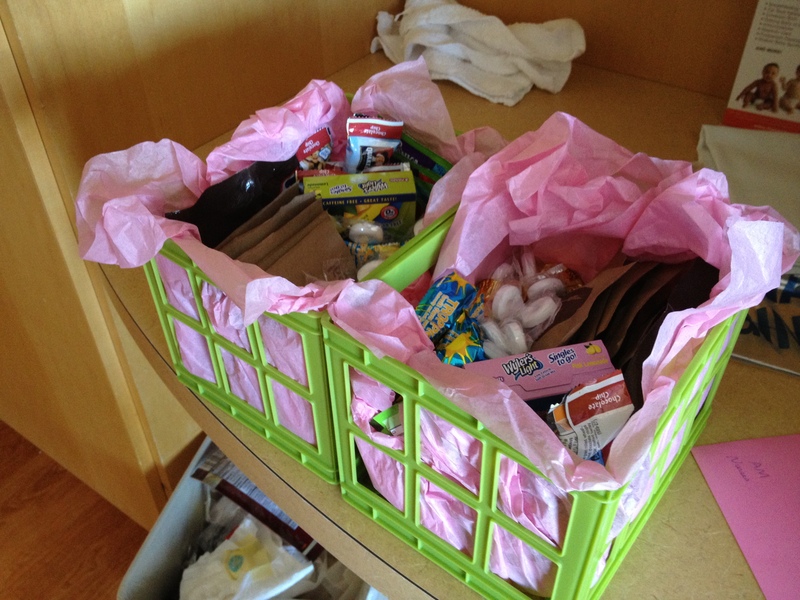 Here are the little thank you baskets I brought to the hospital for the nurses – one for p.m. and one for a.m. nurses. If I had known how amazing they all would be, I would have brought them diamonds! Thank you baskets for the nurses. These were super easy to throw together. Some on Pinterest (click here to see other examples) were much fancier, but I was doing this about 40 weeks and 5 days pregnant, so I kept it simple. I bought a couple of plastic baskets at the dollar store. I stuffed them with tissue paper and I added items that the nurses would be able to enjoy on the go as they worked wild hours. If you feel like it, definitely do something special for your nurses. I know they get paid, but the work they do is priceless!